Roof projections up to 7m available. Select type of polycarbonate and colour required. Price includes 3no 6m 700mm polycarbonate sheets 4no 6m bars to fix to timber 4no edge fillets 1no 2.1m sheet closures 1no 150mm flash band Anti dust tapes Installation Guide Step one ..
Price includes 4no 700mm x 6m polycarbonate sheets 5no x 6m bars to fix to timber 4no edge fillets 3m 2no 2.1mm sheet closures 1no x 150mm flash band Anti dust tapes Installation Guide Step one Fix your first edge bar as shown in dia 1 s.. Select type of polycarbonate and colour required.. Price includes 5no 700mm x 6m polycarbonate roof sheets 6no x 6m bars to fix to timber 4no x 3m edge fillets 2no 2.1m sheet closures 1no x 150mm flash band Anti dust tape Installation Guid.. Select type of polycarbonate and colour required. 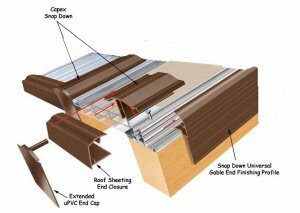 Price includes 6no 700mm x 6m polycarbonate roof sheets 7no x 6m bars to fix to timber 4no x 3m edge fillets 3no x 2.1m sheet closures 1no x 150mm flash band Anti dust tapes Installation Guide .. Select type of polycarbonate and colour required. Price includes 7no 700mm x 6m polycarbonate roof sheets 8no x 6m bars to fix to timber 4no x 3m edge fillets 3no x 2.1m sheet closures 1no x 150mm flash band Anti dust tapes Installation Gu.. Select type of polycarbonate and colour required.. Price includes 8no 700mm x 6m polycarbonate roof sheets 9no x 6m bars to fix to timber 3no x 2m edge fillets 3no x 2.1m sheet closures 1no x 150mm flash band Anti dust tapes Installation Guide .. Select type of polycarbonate and colour required. Price includes 9no 700 mm x 6m polycarbonate roof sheets 10no x 6m bars to fix to timber 4no x 3m edge bars 5no x 2.1m sheet closures 1no x 150mm flash band Anti dust tapes Installation Guide S.. Select type of polycarbonate and colour required. Price includes 10no 700 mm x 6m polycarbonate roof sheets 11no x 6m bars to fix to timber 4no x 3m edge bars 4no x 2.1m sheet closures 1no x 150mm flash band Anti dust tapes Installation Guide Step o.. Select type of polycarbonate and colour required.. Price includes 11no 700mm x 6m polycarbonate roof sheets 12no x 6m bars to fix to timber 2no x 6m edge bars 4no x 2.1m sheet closures 1no x 150mm flash band Anti dust tapes Installation.. Select type of polycarbonate and colour required.. Price includes 12 no 700mm x 6m polycarbonate roof sheets 13no x 6m bars to fix to timber 4no x 3m edge bar fillets 5no x 2.1m sheet closures 1no x 150mm flash band Anti dust tapes Installation G..
Price includes 3no 5m 700mm polycarbonate sheets 4no 5m bars to fix to timber 4no edge fillets 1no 2.1m sheet closures 1no 150mm flash band Anti dust tapes Installation Guide Step one Fix your first edge bar as shown in dia 1 slide..
Price includes 14 no 700mm x 6m polycarbonate roof sheets 15no x 6m bars to fix to timber 4no x 3m edge bar fillets 5no x 2.1m sheet closures 1no x 150mm flash band Anti dust tapes Installation Guide Step one Fix your first edge bar as s..
Price includes 15 no 700mm x 6m polycarbonate roof sheets 16no x 6m bars to fix to timber 4no x 3m edge bar fillets 5no x 2.1m sheet closures 1no x 150mm flash band Anti dust tapes Installation Guide Step one Fix your first edge b..